A persistent customer that attacks by firing discs and light ribbons. You can wear it down, but it will get right back up as soon as it's done recharging. The Commantis is a Dream Eater that appears in Kingdom Hearts 3D: Dream Drop Distance. It serves as a boss for Riku in The Grid. The Commantis has a triangular face with a semi-circular orange protrusion behind its head resembling half an Identity Disk, it connects to the main head with two smaller, rectangular protrusions that are blue and have a yellow line running in between. The Dream Eater has two black lines extending from the black-eye slots down to the mouth, within the eye slots it has two large red circular eyes. Its face is colored green blending to chartreuse, while its mouth and antennae are colored a dull metal blue, a yellow segment is located between the antennae. The Nightmare emblem is located on its chest, right beneath its neck. 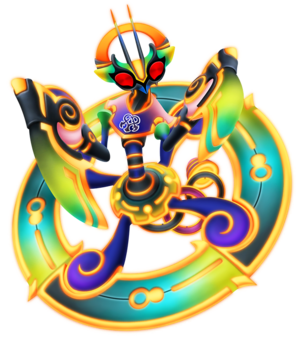 The Dream Eater's body is shaped just like a mantis, it has a metal-colored body with orange circuitry running through it, its two long arms are replaced by swords that blend from a dull grey to green. Its body ends in the middle of a large circular blade that resembles a spinner. It is colored similar to the face of the Dream Eater. Kamakiri (螳螂?) is the Japanese word for praying mantis. Its English name is a portmanteau of "command" and "mantis". When Riku is captured by the Black Guards, he is sent to the Light Cycle arena, where CLU pits him against various other Black Guards in a Light Cycle battle. After Riku takes out some of the guards on their Light Cycles, the Commantis appears from above to eliminate him, presumably summoned by CLU. After Riku defeats the Dream Eater on his Light Cycle, it flies off into the sky. Riku blasts a heart-shaped hole in the arena wall and escapes. Later, when Riku, Sam Flynn, his father Kevin, and Quorra arrive at the Portal, they find CLU waiting for them. He accuses Kevin of breaking his promise that the two of them would change the world together, and he summons the Commantis to demonstrate the applications at his disposal. Kevin is surprised by this, but Riku calmly steps forward and challenges the Dream Eater to battle. Although the Commantis uses CLU's ship to recharge its energy several times, Riku manages to defeat and derezz it.